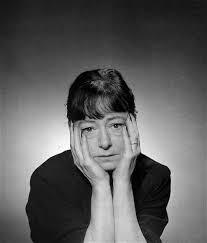 Dorothy Parker has no time for this. 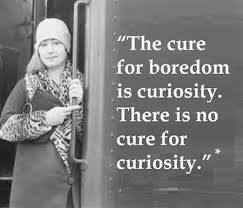 I am a curious person. I am. Always have been. The specific things I am curious about change over time. One can follow the trail of my particular interests by looking at my bookshelves. An interest in Hemingway and Fitzgerald leads to Jazz Age art leads to Dorothy Parker leads to World War I poetry leads to Fin De Siecle Paris leads to Flaubert. It is how this kind of thing goes. It’s how I can start the day listening to a lecture on Democracy and Psychoanalysis and end the day reading Homer. It connects up in my mind. My mind is sharp but it is restless. Having lived with my brain and this mind for this many years, the only constant is change. Whatever shiny thing I am investigating, it will be relegated to second fiddle soon enough. It is a double-edge sword, my neurological set-up. It means I can speak with a fair amount of confidence on a lot of different subjects. I make a killer member of your Trivia Night team. I am great at parties. I can find something to discuss with just about anyone. On the other hand, I’m not an expert at anything. I have no doubt if I had exerted the same amount of effort at one thing that I have exerted in all the things, I would be a leading expert on the specific. College was a disaster. Wandering and restless mind combined with ridiculously high expectations of myself and undiagnosed depression meant disaster. Sham spirals were many and frequent. It used to be one of the major regrets of my life, not succeeding at finishing a college degree. I carried a heavy chip on my shoulder. No one who knew me for more than thirty minutes would doubt I had the intelligence to complete a degree. So why couldn’t I do it? ‘Why don’t you have a degree, Kelly?’ was a question I heard a lot. My standard answer was a shrug. If someone pressed it, I would deflect and say a full answer would require PowerPoint and interpretive dance. The question always made me feel less than. I was ashamed of my failure. I wanted the validation a college degree would give to me. This was the state of affairs all through my thirties. At the top of any list of things I wanted to accomplish before I could be happy, completing a degree was always in the top three. Something happened. I got okay with the concept of ‘enough’. As in, I’m good enough. I’m intelligent enough. Whatever boost I thought a college degree would bring to me, I no longer needed. Things had shifted and the life path I was on was not going to include a lot of credentialing. My friends were instrumental in this and they didn’t even know it. Or maybe they did, I don’t know. My girlfriends are a whip smart bunch of women. Most of them are college graduates. Many of them with multiple degrees from Ivy League schools. In the middle of a late night phone call with one such holder of multiple Ivy League degrees, she said, “Kelly, you realize you are better read than I am, right?”. It was exactly the thing I needed to hear at exactly the moment I needed to hear it. When I was diagnosed with cancer, I followed my usual path and immediately went in search of more information. I went into curious mode. A box of books landed on my doorstep within a few days of my diagnosis. I skimmed through them, put them on the shelf and then never opened them . I went to the bookstore and settled in with an iced coffee and another stack of reading material. I left empty-handed. I spent my life being curious about everything, processing every crisis through my intellect. Knowing as much as I could about something. This time should have been the same. But it wasn’t. In that bright hot month of July, I came to understand this was all going to be different. I knew the only thing I needed to know. I had cancer and it was trying to kill me. I wrote a lot of lists that summer. I wrote lists of things that needed to be done before I started treatment. The tires on the car needed to be rotated. The clutter in the spare room needed to be cleared. I had a filing cabinet filled with court documents related to my paternity suit, those all needed to be thrown out. In case I died, I didn’t want my daughter finding them and reading them. I needed a television for my bedroom. Mundane and profound lived together. I made other lists. I made a list of the things I wanted to do after I was through with treatment. I stayed up all night thinking about that one. If treatment worked, I could live another two or three years, maybe longer. What did I want to do after treatment? Finishing a degree didn’t make it into the top five, not even the top ten. I didn’t want to get married or make buckets of money, either. Through that long night, I realized I didn’t have anything to prove to anyone. I didn’t need to prove how tough I was. I didn’t need to prove how independent I was. I didn’t need to prove how intelligent I was. Being upright and breathing was enough to prove all of those things. What made it on the list were two abstract notions and one concrete. First, I wanted to spend as much time as possible experiencing Beauty. I wanted to experience more art, more performance, more of everything but also to seek beauty in the pursuit of everyday living, seek beauty through expressing my own gifts. Experience more God. Secondly, I wanted to spend time with the people I loved. I wanted them to know I loved them and wanted them to know what they meant to me. I wanted to embrace the sacred, move toward more love. Concretely, I wanted to travel. I wanted to go everywhere. I wanted to eat all the food. I wanted to see all the things. It feels spectacular to no longer have anything to prove. I don’t have to stay out until two a.m. I don’t have to do the tequila shots. I don’t have to finish college. I don’t have to show up for every argument on the Internet to which I am invited. I’m enough of whatever it is I thought doing those things would get me. Enough. I love my curious mind. It has taken me so many places. I worked at the National Security Agency. I worked on political campaigns. I taught a Bible class. I’ve won sales awards and community service awards. I’m writing a book. It’s crazy but it all works. All of it, every bit of it, it all leads me to this minute, this moment of my life when I can take all of it and put it to work. This is how it is supposed to be. Love people. Seek beauty. Get a passport.